Emma didn't truly understand about my panic attacks -no one did. But she'd never pushed me to explain, never tried to ditch me when things got weird, and never once looked at me like I was a freak. (The therapist to Kaylee:) There's a group session about anger management at nine, one about coping with depressions at eleven, and one at two this afternoon about symptoms of mental illness. That's a good one to start with. (Kaylee:) Yeah. You know, places were light doesn't shine? My thoughts: For a few months I add the the German version of the Soul Screamers Series on my wishlist. But I don't want to wait the long time for the translation (likley it will take a few years), so I decided to take the englisch ones of the series. My only problem was to determind among the US and UK cover. Finally I took the US version. 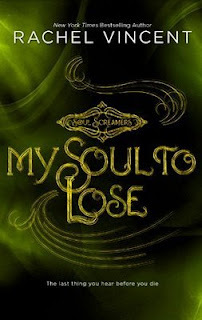 My Soul to Lose is the prequel novella to the "Soul Screamers" series by Rachel Vincent and an amazing start. I do not really want to give my own summary, because this book is too short and the official blurb is absolutely fine. Kaylee is a typical and normal teenager until she finds herself screaming at the mall. The reason for her panic attack is so exciting, thrilling and absolutely well-written. I had a lot of fun to read this short novella and I can't put it down until I finished that book. When Kaylee wakes up in the psychatric unit, the reader easily can put oneself in Kaylee's position. It is so scary and the worst thing - there is no help for Kaylee. Imagine you wake up in a psychatric unit, you are confined to a bed and everyone treats you like you are a dangerous and crazy person. That makes me freak out. But Kaylee can't. She have to get out of the unit and they wouldn't let you go if you freak out, would they? Rachel Vincent's writing style is exciting and amazing. I don't like it - I love it! You can't stop reading and when you finished the prequel novella you have to start with the 'main' series, because you are so curious. And of course the bloody cliffhanger at the end of that book is responsible for you are bursting with curiosity. I'm looking forward to read the complete series during the next months. Take a look at the Soul Screamers Challenge, if you are interested, too.